Michael R. Arkfeld is a practicing attorney specializing in civil tort litigation. His practice includes multimillion-dollar cases involving personal injury, medical malpractice, wrongful termination, and a host of other tort claims. He has appeared before both federal and state appellate courts and has tried over 30 cases to a jury. His duties include preparation of case management plans, investigation and deposing of expert and lay witnesses, pretrial preparation of witnesses and document organization, pretrial filing of documents, and appearances for motion hearings, pretrial conferences, trials, and appellate arguments. Since 1985, Michael has incorporated personal computers extensively in his legal practice and lectures frequently throughout the United States on the impact of technology on the practice of law. 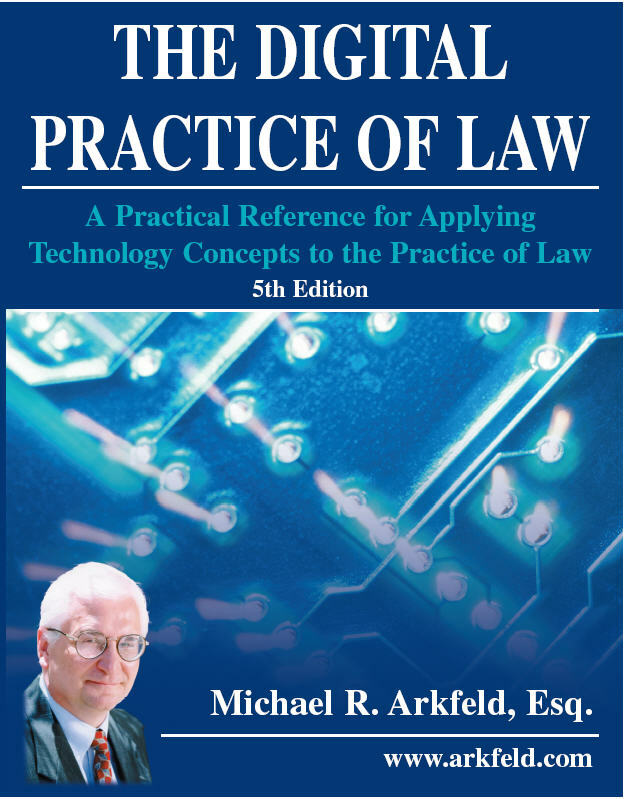 His approach to using computers in the practice of law includes calendaring, case action plans, full text document management, imaging, document assembly, databases, spreadsheet applications, graphics, Internet applications and computer-generated simulations. Michael is a licensed attorney in the State of Arizona, member of the American Bar Association and a member of the Litigation and Law Practice Management Sections. Michael has been the assistant editor of the Litigation Applications Newsletter and a Board Member for TechShows 1996, 1997 and 1998. He was appointed Chair of the Technology Committee for the Judicial Division for 1997-98 to plan technology programs for the Judicial Division. In 1995 he was appointed chairman of the Task Force on Integrating Technology into the Justice System for the Arizona State Bar. This task force facilitates the integration of technology in the justice system in the State of Arizona. Committee members include representatives from the courts, legislative, executive, state bar and law schools. He is a monthly columnist for the Arizona Attorney magazine and a contributing writer to the American Bar Association Journal and a variety of other legal publications. Copyright ©1991-2009 Michael R. Arkfeld, all rights reserved. No part of this publication may be stored in any information retrieval system, transmitted, or reproduced in any way, including but not limited to photocopy, photograph, magnetic, computer file or other record, without the prior agreement and written permission of the publisher or author. Making a copy of any part of this book for any purpose is a violation of the United States copyright laws. All involved in the preparation and distribution of this product make no representation or warranties with respect to the contents hereof and specifically disclaim any implied warranty of merchantability or fitness for any purpose. This publication is sold as is, without warranty of any kind, either expressed or implied. All parties involved in the preparation of this book assume no responsibility for any consequential damages that result from the use of this product. We do not guarantee the accuracy, adequacy or completeness of any information. It is sold with the understanding that the publisher is not engaged in rendering legal, accounting or other professional services. Mention of third party products is for informational purposes only and constitutes neither an endorsement nor a recommendation. The author assumes no responsibility with regard to the selection, performance or use of these products.